You may chuckle and say to yourself that any garden we have God gave us. You’d be right of course. But usually one does make a decision about where a garden will be, whether vegetables or flowers or formal shrubs. The gardener chooses seeds or seedlings or plants, forms rows or hills, and plants with great hopes for a beautiful show or a bountiful harvest. This garden in our backyard didn’t happen that way. There was a dense line of shrubbery along the curve of the driveway near our back porch. When I looked out the kitchen window that line of shrubbery blocked my view of the grassy area where children like to play. It was nice shrubbery but had been there, it seemed, for an eon or two. I’m usually slow to take any bushes or trees down, but this time I asked Charles if it wouldn’t be nice to clear the view. So one Saturday Charles and Ulysses and a rented tractor began work on removing the six or eight overgrown and very thick shrubs. It turned out to take several Saturdays since the bushes were so stubborn and had their roots in the Himalayas. Then there was the great pine stump, now exposed, whose roots must have been at least a century old. The wood had matured into Georgia fatwood, or rich pine as north Georgians call it. First, Charles began sawing the stump into rounds from the top down, each round about six inches thick and a full two feet across. But the old wood was so hard it was taking forever, about to ruin the surgery he’d had on his shoulder as well as maybe ruin the saw too. He decided to get Mike Bond to take it out with his front end loader. Mike roughly filled in the great stump chasm before he left us. Charles and Ulysses began leveling, shoveling, and raking the reddish soil. We planned to put sod down. In the meantime, a crepe myrtle tree, which had been behind the shrubbery, now waved its branches in glee and blossomed in watermelon pink, in full view of the kitchen window. 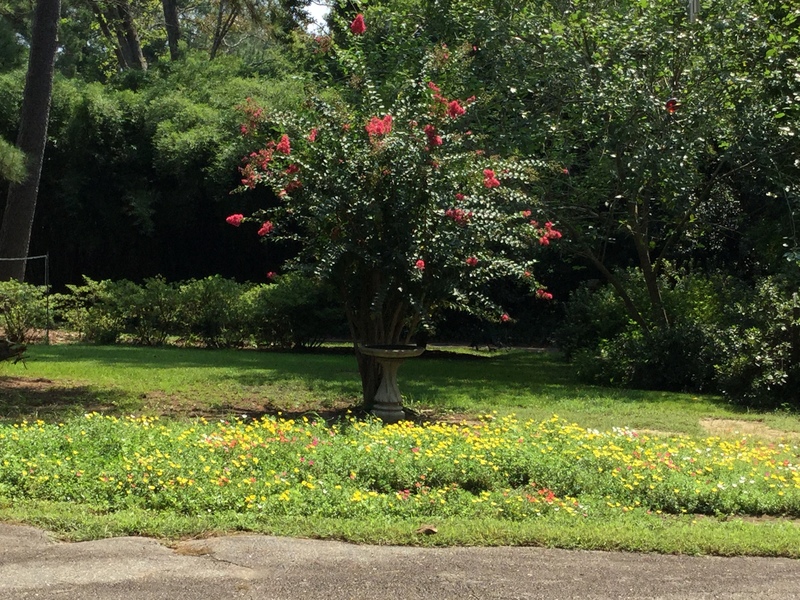 Charles placed a bird bath in front of the crepe myrtle and we were really happy with the new look, even if the soil was so bare. The stump, now rolled to the side, demanded a lot of Charles’ attention. He couldn’t imagine just disposing of such a huge reservoir of fatwood. So he directed Ulysses to chop chunks of the stump off, the right size to make splinters. Their attention was entirely shifted from the bare ground. One day we noticed a mat of interesting foliage beginning to cover the raw ground. The next day a few flowers appeared. Within a week the whole expanse of “new” ground was thick with red, yellow, white, and pink flowers. Since then they have multiplied and grown into a lively midday show. The view from my kitchen window! I began asking different ones what these flowers might be. Some had speculations but no one was sure. Finally my house cleaner, Lisa George, declared quite positively that most of the flowers are moss roses. Since she used to operate a nursery, I was sure, even before I looked them up online, that she was right. But how did we get this garden? Lisa says these flowers are grown from loosely scattered seeds. But we didn’t plant any seeds. The flowers are profuse over the very area where that thick shrubbery shaded the ground. Though we remember now seeing a few scattered flowers last year in a nearby area, there were certainly none under those old bushes. So did they lay dormant? Did someone scatter seeds decades ago? Interesting thought! The flowers open every morning between 10:00 and 11:00 and begin closing about 3:00 p.m. Their colors are vibrant and the bees are busy every day collecting nectar. And did I mention butterflies? Oh my! Monarchs and many others, some tiny, some awesome in color and size. I do love to see them hovering and dancing over the flowers. We really enjoy watching our garden, showing it off, speculating about it. I think you will understand now why I call it the “Garden God Gave Us.” Seeing the blossoms open every day is a foretaste of heaven. P.S. Would anyone like some nice Georgia fatwood?